13 posts categorized "USA, New York"
There are more Starbucks in London than in New York. Who knew? A great article on the history and rebirth of the 2nd Avenue Deli. I no longer need an excuse to go to NY. Alain Ducasse's restaurant Spoon+ is closing at The Sanderson Hotel in London. This is big news on several fronts. First, Ducasse restaurants rarely close (Essex House in New York is one such rarity) and second it is being replaced by a restaurant fronted by Jeffrey Chodorow. He's relatively unheard of in the UK despite being the man behind Asia de Cuba and, er, Spoon+. Ducasse's name is on the door, but Chodorow is the Svengali behind the operations. Although he has a couple of places in London, he is largely unheard of over here whereas he is big news in the States. He came to national prominence thanks to the car-crash TV programme: The Restaurant. Chodorow and chef Rocco di Spirito were opening a restaurant and thought it would be great to do a reality TV show about it. Unfortunately, it all fell apart, with the enmity growing between the two partners as the cameras rolled. It was compulsive viewing that resulted in high ratings, the restaurant shutting and Rocco shuffling off into some obscurity. Chodorow emerged seemingly unscathed. Chodorow clearly loves a bit of controversy because he is now at the centre of another storm. One I'm guessing his UK PR team are less than delighted about, because they are hawking him around British food writers, ahead of the new opening at The Sanderson. This latest bust up is with New York Times restaurant critic Frank Bruni. ...how does a review in which the main player, Kobe beef, is acknowledged by Mr. Bruni to be perfectly prepared, warrant zero stars? Hold on a moment, a reviewer is there to review, not to heap unquestioning fawning praise. So, do the UK reviewers have a lot to fear? Possibly. I have read a description of Chodorow's restaurants as like TGI Friday's for rich people. Clearly not meant as a compliment, it seems very possible that if he opens such an establishment at The Sanderson, Marina, Fay, Jay and the rest of them will not be too positive in their reviews. It will be interesting to see whether we'll have a Chodorow Smackdown UK Edition. Frank Bruni, the New York Times restaurant critic has given Gordon Ramsay at The London two-stars. In NY Times review lingo, that equates to Very Good. When you read the review, it is clear that very good is not that good. The meal was well cooked, with good ingredients but was uninspiring, the room was too clinical and there were some serious duff points in the meal. ...while looking forward to the seemingly inevitable day when your top-tier restaurant choices in a major destination on one continent are much the same as those in a major destination on another. The world's best chefs are keen to spread their brand as far as possible. Alain Ducasse is a fine example. He is a fantastic chef, but where is he chef of? He has two restaurants that in theory he cooks in, Plaza Athénée in Paris and Louis XV in Monaco. However, in his group there are a further twenty restaurants crisscrossing the globe: Tokyo, Las Vegas, the Basque region and various places in between. Despite spreading himself so thin, he has not come in for any criticism. True, no-one suggests he cooks at any of these places other than Plaza Athénée and Louis XV, but he is developing a global footprint. There is a strange disconnect with this trend and the growing popularity of eating locally sourced and inspired food. This tends to be a home cooking phenomenon, but there are a lot of chefs who have taken the concept to heart and make a virtue about the local nature of their restaurant. The flip side, and rarely voiced side of fine-dining, is that most restaurant's could not survive without having large quantities of their food flown in from around the globe. In complete contrast to the local evangelists, restaurants like Kuruma Zushi make a virtue that some of their fish is flown in from Japan on a daily basis. So while at home we want to eat food grown within sight of our front door, when we eat out we seem to be pursuing an internationalists dream. When Joël Robuchon opened his Atelier in London there was a lot of excitement, as there has been around Ducasse coming to The Dorchester. Which is odd because in this age of cheap travel, lots of people have access to their cooking in Paris or New York, or even Tokyo. And given the dining habits of most Londoners, they are as likely to hop on easyJet to Paris, as they are to pop into The Dorchester for a morsel of Ducasse. So why do we care so much and see it so positively that these new restaurants will be on our doorstep? I can only conclude it comes down to us buying into the chefs brand. I do not mean to denigrate the quality of food or service at these restaurants, but the brand is all important. Which means it is a very commercial enterprise. Again, no problem with that, chefs have to make a living. Nonetheless I feel a certain unease, expressed by Bruni above, that there is a growing homogeneity of fine-dining restaurants. Is there any difference knowing I can get the same fantastic mashed potatoes at L'Atelier de Joel Robuchon in London and Paris, as knowing I can get the same McDonald's chips in both those location? Aren't they just as regimented as each other? Maybe this is the future of fine-dining restaurants, if it is I find it a bit depressing. I like the idea that when I go overseas I am going to have new experiences not the same mash/chips I can have at home. It is questionable whether a write-up about a restaurant that has now shut its doors for good, or at least for a year, is a timely one. I suppose at best it is useful for posterity. It is also questionable whether a write-up based on a meal on the last night of a now closed restaurant is useful at all. It is generally considered bad form to review a restaurant in its first couple of weeks because they are only just getting into their stride (viz St Alban's soft soft opening compared to its soft opening) and should be ironing out some cracks. So where does that leave me writing about my meal at The Reindeer on its last night of operation? Again, there might be some value in it for posterity and my own vanity. I can say, "I was there" if it turns out that is important. Silverbrowess and our friends the Newlyweds, are also able to make that claim. The Reindeer received a lot of interest recently for two reasons: it is hip and like all things hip, it is fleeting. It was opened by the team behind Bistrotheque, and was only open for the month of December. And even that was truncated: 1 December - 23 December. I understand that they might repeat the experiment next year in New York and so on around the world. If they do, I am not sure whether I will bother becoming a Reindeer groupie, other than for the benefit of saying "I was there." I am unsure where Silverbrowess and the Bythennotsonewlyweds will stand on the matter. The food was very good, especially given the high risk that the theatre of the restaurant risked overshadowing what was put on the plate. I have not eaten at Bistrotheque but clearly from the respective menus (The Reindeer, Bistrotheque) the food is of a type. However, we were told that none of the staff, either front of house or in the kitchen are the same. The owners were explicit they wanted separate ventures. Rather disappointingly for this write-up, the breadth of dishes around the table was limited. Me and Mrs Newlywed both started with a very tasty celeriac and black truffle soup. White truffles are usually the superior model (and nearing the end of their season) but the soup was excellent. It was rich, with distinctive nutty, earthy flavours. I don't think that truffle oil was added, but if it was, it was decent stuff, not the over chemicalised slick too often glugged by chefs trying to impress. Silverbrowess opted for a roquefort, walnut, pousse and orange salad, which she said was good, Mr Newlywed had a similar verdict on his smoked salmon. For those wondering, pousse is a type of spinach. For mains, me and Mrs Newlywed both had the veggie option of a pithivier of roast veg with sprout tops, camembert and chestnuts. This was an exceptional dish. I fall into the lazy school of sprout haters, but combined with pungent camembert and sweet chestnuts, the almost sweet sprout tops (tasting not too different from turnip tops) were the highlight of the night. Chestnuts and sprouts are a fairly traditional Christmas dish, adding Camembert to it, lifted it above the normal dross doled out on December 25th. Silverbrowess and Mr Newlywed both opted for the poached trout, wilted spinach, caper and lemon butter. Again, both deemed it very nice. It didn't blow my socks off but was a solid dish with strong flavours. The trout was beautifully cooked, with the skin glistening. The flesh yielded to the fork in dense white flakes. Desserts were similarly well accomplished, helped by the demob happy staff who were happy to chuck comped dishes and drinks our way all night. My favourite was the bread and butter pudding, easy to do well but so often cocked-up. This was a very enjoyable meal, the food was good and the service was excellent. There was a real sense of it being the end of term for the staff. From what they were saying, Christmas would be a well deserved rest. Our waiter told us they were notching up fifteen hour days, I heard a waitress say that in two weeks she had worked over 200 hours. Clearly they have not heard of the Working Time Directive. However, despite a relaxed air and shattered staff, service was excellent. I was a bit disappointed at the number of dishes off the menu, especially the wild mushroom and champagne risotto and the four of the twenty reds all dried up. But given the place was only open for a month and this was the last night, it could have been worse. It is irrelevant to say whether I would go back again but I will say that if they do move to New York next year, I would strongly suggest that for some fun and decent food you go along. It will not be an astounding meal, there is no point Frank Bruni reviewing it, but it will be a very good meal, you will enjoy your meal and more importantly, the evening. Does anyone really want much more from a restaurant? 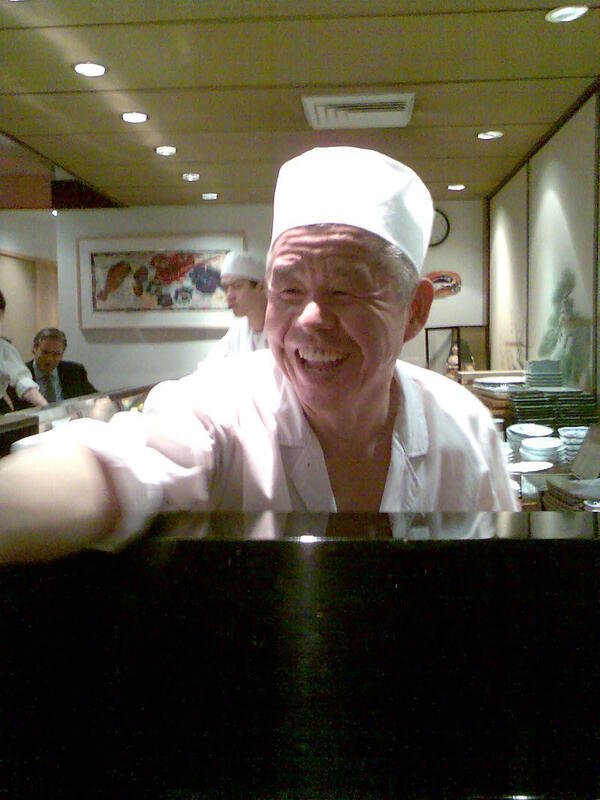 Rumour has it that Masa Takayama, chef patron of Masa in New York is scoping out sites in London. Masa is regarded as one of the best sushi restaurants in New York and is renowned for the exceptional quality of its fish. It is also one of the most expensive sushi restaurants around, charging in the region of $400 per person, plus drinks and service. I have not eaten there but supposedly Masa should be compared with Kuruma Zushi and Urasawa. These restaurants get away with extortionate bills because the fish is exceptional. Customers understand that if they want the highest quality, they are going to have pay through the nose for it. Even Sushi Yasuda, which is closer to $150 per head for its omakase, is much more expensive than what we in the UK regard as our very best sushi restaurants. The most well regarded British sushi places tend to be relatively low key, suburban restaurants like Sushi Say or Cafe Japan. Nobu and Zuma are exceptions, because they are expensive, but they trade on their celebrity status as much as their food. As far as I am aware, there are no examples of the 10-seat sushi bar, overseen by a sushi-master, obsessive about the quality of his fish. Since eating at Yasuda, Kuruma and Urasawa, I have been sorely disappointed by sushi in London. The quality and therefore flavour, of the fish is incomparable this side of the pond. If he does open in London, one of the hurdles Chef Takayama will have is sourcing his fish. I assume he will have to fly it in from Japan, as he does with some of his fish in New York. Before we get too excited about the prospect of Masa London, we need to remember that this is only a rumour. Masa might have just been here on holiday - we do get a lot of American and Japanese tourists you know. Additionally, he has made very clear that he frowns on the idea of chefs with multiple restaurants, let alone chefs with multiple restaurants on multiple continents. He shut Ginza Sushi-ko in Los Angeles, before opening in New York, because he felt it was impossible to run both to his self-imposed high standards. In Michael Ruhlman's latest book The Reach of a Chef, Masa is crystal clear that the success of the restaurant is predicated on him and his interaction with the food. So, for example, if Masa is unwell, the restaurant is closed. This therefore begs the question whether he really would contemplate opening in the UK. It seems unlikely, it also seems unlikely he would repeat his previous trick of shutting his existing restaurant to re-open thousands of miles away. More likely is that he was on holiday or he was acting as consultant to someone looking to open up a Masa-a-like. If it was the former I hope he enjoyed himself, if it was the latter, it would be very good news. It would raise the game of UK sushi restaurants, unfortunately it would also raise prices. I can't be bothered to begin to guess how many restaurants there are in New York. It is fair to assume there are enough that they all need to vie for attention. The most obvious way is with a decent frontage - make it clear to the passer-by that within lies a restaurant. 7 East 47th Street is an office building. A very dull office building by New York standards. Its entrance is narrow, not much wider than its plate glass door, the hallway lit by a dull yellow bulb and manned by a grumpy security guard. This is your first impression of Kuruma Zushi. It would seem this is not a restaurant that feels a need to attract passing traffic. Which is lucky because it is tiny and could not handle walk-ins. Perched on the first floor (or second according to Americans) is a small sushi bar with not more than fifteen seats. There are some tables around the back, but you do not want to sit there. The sushi bar is where the action takes place. In an atmosphere that feels more like a home than a transcendental experience the customer is served course after course of sashimi. I had dinner with Silverbrowess and a friend. I was supposed to be taking Silverbrowess to Yasuda, but was convinced by our friend that Kuruma was better. I gasped at the prospect but he was right. He should know, he is a semi-pro food critic. Unfortunately, he forgot to mention it was going to be as expensive as Urasawa. Gulp. But it was much more enjoyable. Phew. I was told the fish is flown in from Japan. I am unsure whether this is all the fish or just some, such as the succulent fatty tuna. Either way, this flight of fishy must account for a fair proportion of the cost. Food miles fascists might be aghast at the prospect, but we need to be realistic that the best restaurants only serve the best ingredients and they are not always outside your door. Home cooks can and should shorten their horizons, but professional chefs often do not. The fish at Kuruma was outstanding and the meal is essentially an omakase of sashimi. If you like nigiri, you can opt for that, as Silverbrowess did. Be warned, they like it if you eat your nigiri with your fingers rather than chopsticks. Silverbrowess demurred and opted to wield her sticks instead. Throughout the meal the three of us kept saying that the fish was creamy. As a descriptor for fish I appreciate that can sound gross. It reminds me of that gunk you get on overcooked salmon (a speciality of my grandmother, along with brown asparagus). But for fish of this quality it is meant as a compliment. I think the creaminess can be attributed to the rich, fatty, silky texture of the fish. The fatty tuna made my mouth water, craving for more. Many of the dishes I ate had a depth of flavour unrivalled by anything I have eaten before. I am not saying I have never had tastier food. I am saying that I have never experienced repeated hits of something so pure, so untainted, that tasted this good. For this price meal (remember, up there with Urasawa) you expect everything to be spot-on. There were flaws, in particular a couple of the dishes were icy cold and I must assume their flavour was dulled. However, I should note that I was the only one of the three of us to complain of this, so maybe my gnashers were a bit sensitive. This was a truly excellent meal. In the UK we are used to paying a lot for meals when the chef has had a large input of working magic on a group of ingredients. With sushi, you are paying for the opposite. The ingredients are left to work for themselves. I suppose in both cases one could argue it is about doing what is best with the ingredients. The difference lies in the doing.